I “Discovered” Mepkin in August 2009 (well, truth be told, that’s not the way life works – we don’t “discover” anything; we merely “uncover” what God previously placed there). Hence, the “uncovering” relationship I’ve had with Mepkin Abbey dates to a summer that, if looked at on paper, is still one for the ages. Our eldest daughter’s wedding was scheduled for July 9. In late June the family took what we dubbed “The Last Dance,” a week’s vacation at the family cabin in northern Michigan. The word to describe it – awesome! The wedding was legendary (at least in our minds); more fun than is allowed in most states. Two weeks later I was in Chicago (our favorite city) for my mother-in-law’s 80th birthday bash. Off the chain. However, on the drive home, in spite of what had gone down as one of the dreamiest summers of my life, I mused that something was missing; I wanted more. Not more items on a calendar. What was lacking was not an itinerary/activity thing; rather, it was an internal thing. My soul hadn’t been nourished. I had been a retreatant at Abbey of the Holy Spirit a dozen or so years earlier. Hadn’t given much thought to a monastery since. Too busy building kingdoms of my own while working for Young Life (an outfit that targets teens disinterested in the church and Jesus). By the summer of 2009, I was administrating the Jacksonville (FL) extension site of Gordon-Conwell Theological Seminary, a multi-denominational seminary located north of Boston. Best job I ever had; loved what I was doing. But my soul was malnourished. Now you know the back story to the week as a retreatant in August 2009. The grounds at Mepkin house an assortment of gigantic trees that the South is famous for, Spanish moss, the Cooper River, grass lawns, gardens, and benches. In that charming southern setting tranquility, serenity, stillness, silence, quiet, solitude, slow pace, low volume, and peacefulness abound. The Mepkin “experience” provides an idyllic exterior setting in which to do soul work, retreat, meditate, worship, praise the creator, center, contemplate; in short, to be still and know the I AM God. Mepkin extends an invitation to take an internal journey surrounded by an external oasis. I wanted to experience the “full monte” of the monastery, so I requested a work assignment the first morning. I suspect they didn’t quite know what to do with that, requesting that I return the next day. Spent the next three mornings working with Father Guerric on a burgeoning vegetable garden. We talked, sometimes even using words. My soul did the listening. And supped. 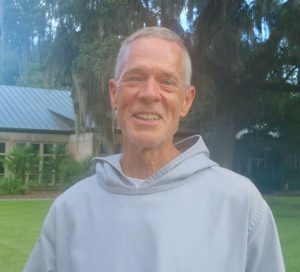 Have returned to Mepkin on numerous occasions, the most recent half dozen or so as a Monastic Guest (“Guest Monk” has a more charming ring to it!). They have allowed (no….WELCOMED) this Protestant minister to come for anywhere between 2.5 – 4 weeks (my wife prefers 2, me 3; so 2.5 is the current compromise). Why return? Why drive the 4.5 hours north on I-95, turning east on I-26, just past Moncks Corner (how fitting!)? The monks; the serenity of the near-sacred grounds; the rhythm of prayer, Lectio Divina, and work. And the inner journey. The inner journey is where the REAL Mepkin shows itself. It is a journey that stirs up the soul, stimulates the mind, and captures the heart; as the reality of who, what, and WHOSE I am are confronted and clarified. Once the soul is engaged, tranquility is met with conflict, serenity with agitation, stillness with disruption, quiet with noise, and peace with disturbance. All of which are the speed bumps and potholes necessary for the journey to knowing the I AM God. It is being examined as I examine Him. The impact? I settled into life “on the outside” following my first stint as a Guest Monk (see what I mean?!). A couple days later I was musing again. Something was missing. It was the extended time hangin’ with Jesus, exploring what it means to come and follow, to abide, to be still and know the I AM God. Made a pact with my creator – wake me up whenever, and I’ll meet you. The past 5-6 years it has been feet on the floor while it is yet dark (about the time most of the Monks are in the chow line). Whereupon I sup myself, fed by His word and presence. On an inner journey into the depths of where He resides within me. I am getting to know the I AM God; and He is simultaneously allowing me to roam the pasture lands of my inner being. The journey to Mepkin has become a journey into the silent land of my interior. It has been the grandest of adventures uncovering and being uncovered. Come, join us!